After years of disliking floral prints, it’s all I can think about! I’m also still eyeing a lot of easy to wear dresses and I’d love to mix the two. You guys! Rivet and Sway, where I got my super adorable glasses, is on sale via zulily today. Check it here: $99 for one pair of glasses with lenses. You buy a voucher that expires on Dec 31, so you have plenty of time for them to ship you a few pairs to try on. (Plus, use that link to buy the voucher and I get referral money from zulily!) I had so much fun trying on my pairs (see?) and I am definitely going to be buying a second pair. Which, I still have to decide. Tusk? Umami? Je Ne Se Quois? Petite Allegro? So many awesome choices. 1. Dark wash jeans. I’ve generally always preferred a medium wash, but I am really digging how the darker wash can dress up more. Ideally, I’d like these to be a higher end jean than my usual Old Navys – I want something quality that will last. 2. Green cardigan. Kelly or darker, I think. 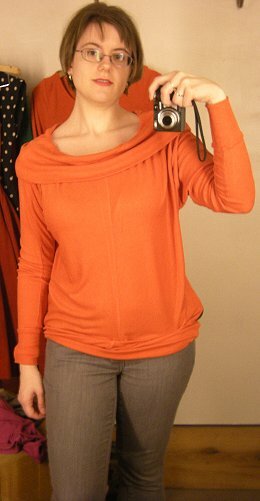 I have a light green boxy cardigan that I rarely wear, and I’d like something more functional. 3. Sweater dress. They are just so damned cute. 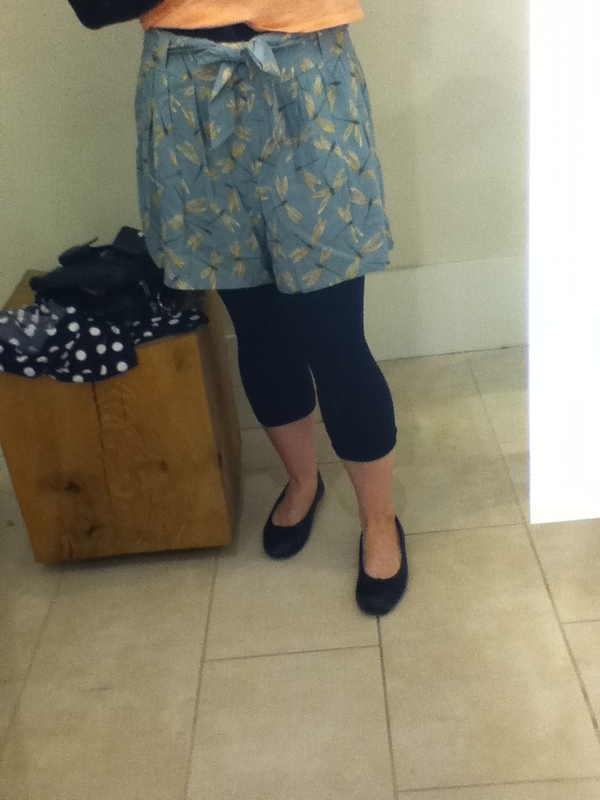 I tried two on at anthro yesterday and loved them both, but neither came in my size. Augh. The hunt continues. I am drawn to grey, but the one I really loved yesterday was berry, so I am open. 4. Brown boots! Something cute and slouchy with a heel. I love my black ones, but I’d love them more with a bit of a heel. I just think boots look best arched, I guess. I am actively working on this one and plan to hit the new DSW next weekend. 5. Skater skirt. I love full skirts of any length, but the short is really grabbing me yet again. I am actually loving the pleather versions I’ve seen and am considering a cheapie Charlotte Russe version for that, and going fabric for another. 6. Pleated skirt. Again! I love my grey one and I still want more options. Of course, I flinch at the price every time I see one I like, which isn’t helpful. Still, I keep searching. 7. Button up skirt. I love buttons. My favorite jeans ever were button up, too. I love the look, but it’s been hard to find this style. 8. Patterned tights. I love the look of sweater tights, sweater print tights or cute little bows or dots. I’d like to play with tights as an accessory. 9. More belts. I got away from using belts at all this year, and I’d like to introduce them back in. If they are fun and studded, so much the better. 10. Cat eye glasses! I love my cat eye sunglasses, and I love the slight cat eye my new ones have, but I’d still love to find a pair of real cat eyes that fit my face. I hope to try another cheap online glasses place this year. And now for blog resolutions! 1. Get more involved with the blogging community. I’m more of an observer than participant, but I loved doing the Everybody Every Wear challenges this year, and I’d like to find more ways to meet people. Like, why don’t I ever submit for Roxy’s weekly Anthro wear posts? I wear Anthro all the time! 2. Learn how to do my hair and make-up. My friend Liss agreed to do some classes with me – several localish places offer classes in the salon or at home, and I think it would be worth $100 or so to finally learn how to do these things. 3. Work on my photography skills. This is a constant work in progress. A new, better digital camera is also on my to-buy list for 2013. Maybe for my birthday. 4. Keep developing my style. I feel like I’ve moved away from my super retro girly look a little bit, and I’d like to play with some slightly edgier looks. But of course, looking at my wishlist, it’s clear that I still love girly and retro! So I’d like to find a balance and keep having fun with it. Last December, I posted a wishlist and I did pretty well successfully fulfilling it. This is what I’m on the lookout for this season. 1. Floral dress. More florals in general, actually. Which is contrary to what I’ve ever wanted, but they are appealing to me with their cheeriness. 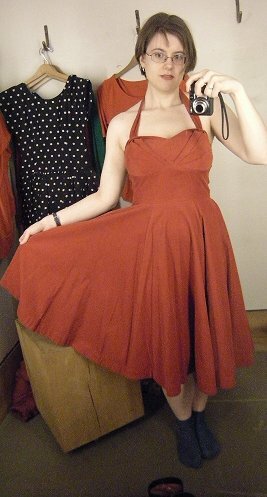 This also has a collar and tie I’m interested in, so I might actually be purchasing this dress soon. 2. Skater dress. I adore the H&M one I own, so why don’t I get another? I also want more stripes in my closet. I like stripes. 3. Sailor style something. I especially love the collar with jaunty little tie. 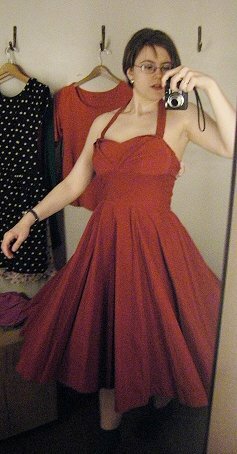 This dress isn’t exactly what I want, but it gives a good idea. 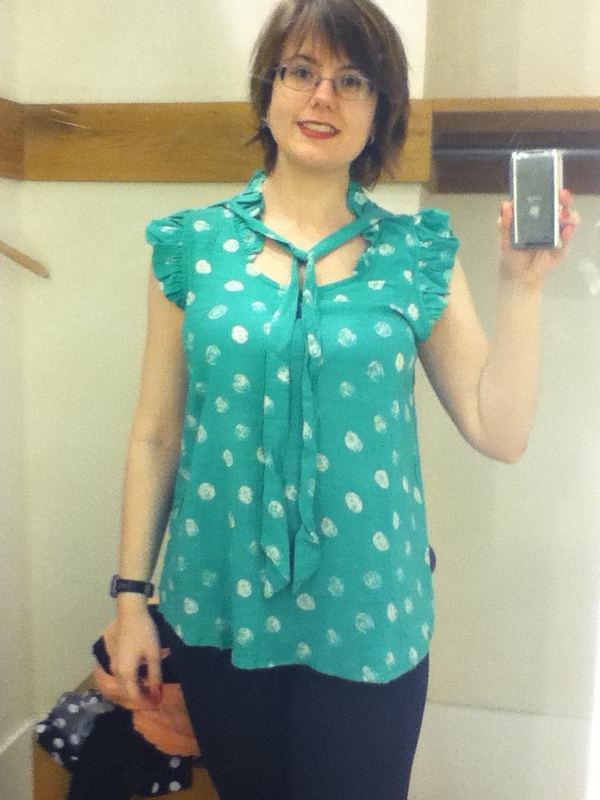 I’ve also been eying this Forever 21 top except I am not sold on the length or width. But the collar! So cute! 4. Stripes. Really. More stripes. 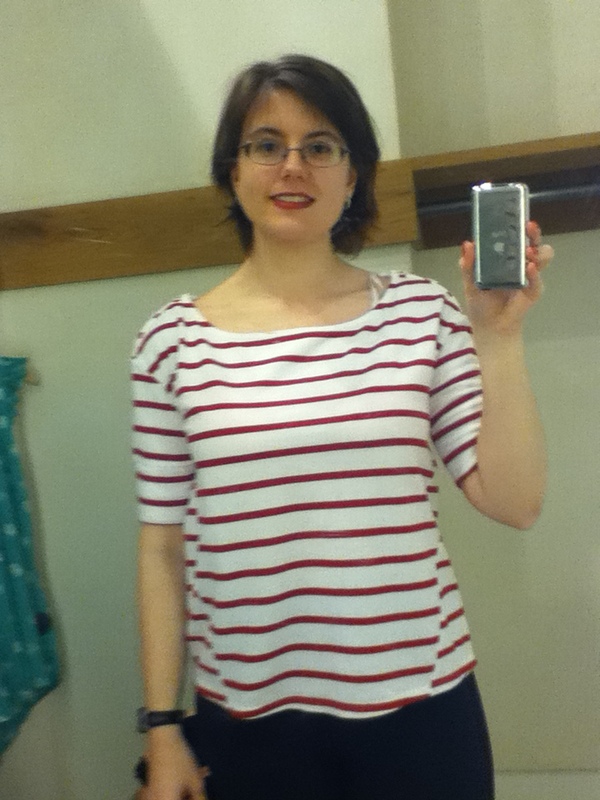 Maybe I need to head to Old Navy this weekend and see if I can find some cute, cheap striped tops. 5. Skater skirt. This is a repeat from the winter. I actually have fabric to try and make my own, if I can sit down and make myself try it. But I love the drape of circle skirts and I want more. 6. Pleated skirt. This is also a repeat. I love the grey one I have, but I’d like one in a brighter color and longer length. I’m going to try wearing the grey one without tights, but I’m not sure it’s doable. We’ll see. 7. Swing shorts. I love the retro style of these. My dragonfly shorts from anthropologie are like these, although I think I might should have gone up a size to get proper swing. They fit, but my thighs might be a bit too big for the right look. Which might be a concern with any pair, so I continue to try and tone my thighs and find the right way to wear them. 8. Scarf. Not necessarily a skull print or a McQueen (although either would be great! ), but a smaller and more narrow one than I currently own. This might be something I can make myself pretty easily. 9. Peter Pan collar. I scoffed for so long, but they look so cute on Mad Men. A top or dress with one would be fun, but it could be cool to have a removable one to change the neckline of different sweaters and tops, and to add a fun touch of color blocking. I nearly bought a beaded necklace collar from H&M last week for the same look, and I might go back for it. 10. Cat eye glasses. Some day. I’m pretty happy with my current wardrobe, but I admit, there are things I dream about getting. 1. Red shoes. Well, honestly: any non-black shoes. I have olive heels, pink flats, brown flats, brown Doc Martins and a bazillion pairs of black everythings. I need variety. And I especially need red. These are super cute red Dansko’s I’ve had my eye on. 2. T-strap shoes. Preferably in red, but definitely t-strap. Whyyyyyyyy can’t I find these anywhere? Am I shopping in the wrong places? I want. Badly. Any ideas or leads? 3. A red swing coat. I have a green peacoat that I love (thanks, Rory! ), but I want a coat with shape and flair and fun in addition to a cool color. I actually saw the perfect coat two winters ago, made by Jessica Simpson, but I did not want to spend the money. I sincerely regret that move. 4. Plaid pants. I scoffed at them earlier this autumn, but I’ve caved to the Betty Draperness of them. A coworker and I had been talking about this one pair from anthropologie for months and then they went on sale last week ($270 down to $70), but I hesitated at buying them online without trying on. I may check the store when I’m in the area on Friday – despite the fact that Kurt Hummel wore them last night on Glee. Augh. I go back and forth on whether or not I could pull them off, but I’d like to try. 5. Skater skirt. I love circle skirts of all lengths and I love skirts that twirl and swirl. This one, although only representative of the style, is adorable. 6. Knife pleated skirt. Again, I scoffed at them for ages all fall – they were on the frumpy side of retro, I thought. But I kept seeing them everywhere and everyone made them look so cute and modern and damn it, I want one now. But even at Old Navy, they are expensive and I’m cheap. So alas. I am without. 7. Oversized sweater. This urge has surprised me lately. Last year, after losing weight and buying clothes that fit, I was obsessed with showing it off. This mostly meant I belted EVERYTHING, at my natural waist, in order to draw attention to it. I still have work to do with my body image, but this year, I’ve relaxed that tendency. And now, I think a slightly oversized, slouchy sweater with a lot of drape paired with leggings sounds cute. Except I don’t own anything like that, because I was so paranoid last year. *g* I see this combined with layering and graphic tops a lot on blogs, which I also find adorable, but I think I’m too old for that. Sadness. 8. Bib necklace. I own a few, but I’d really love one with brightly colored flowers. Something I could pair with a lot of different tops. I keep my eye out, but nothing catches my fancy. 9. Cat-eye glasses. When I got my new frames earlier this year, I wanted a nice, subtle cat eye. There was nothing of the sort available where I was, and I needed new glasses fast so I didn’t shop around. I regret that, too. I like mine fine, but I wish at least one of my pairs was just FUN. I was not paying attention – I should have gone for an even 10 items! Ah, well. I don’t even know what else I would have picked! Yesterday, I read Meet Me In St. Louis for the first time. Everyone knows the movie, I’m sure – Judy Garland, Have Yourself a Merry Little Christmas, Trolley Song, etc. I just found out it was based on a book written in 1941, and checked it out. Overall, fun, but not as charming and wonderful as the movie. But what really stuck with me was the fashions. Despite being written in 1941 and set in 1903/4, it’s the story of teenage girls and they haven’t changed much. In the span of 100+ years, they still buy manicure kits, obsess over boys and freak out about not having the proper thing to wear. In 1903 (and 1941), sailor style dresses were very much in vogue. We seem to be in a bit of a renaissance of that style right now, too; mostly in terms of stripes but I also see jaunty little ties everywhere. And damn it, I want in on it. I want the vintage look. I want the modern vintage look. I want the modern look. I want the Is-this-really-possible-to-wear unironically look. I want to look like Carney, damn it. I have for years. ETA: And I want to look like Princess Catherine! An Alexander McQueen sailor dress, I am in love. But I have more sense than that. 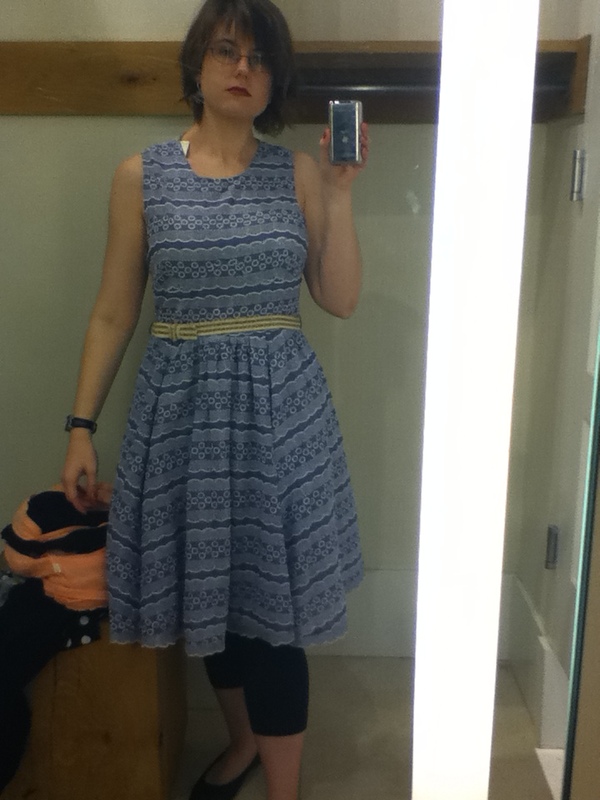 *g* With limited librarian funds, I need to only buy things I can wear for several years. And things that don’t make me look like I’m playing dress-up. My friend and I are talking about going to Disney World in October for Mickey’s Not-So-Scary Halloween party. For this, adults are allowed to wear costumes, too. I have a Snow White costume I got almost ten years ago when I worked in an elementary school – it’s been pulled out for many years, working in preschools and children’s libraries since then. I could totally wear it to Disney, too – but it’s baggy now, and it’s old, and I wouldn’t be the only Snow. So cute! So clever! So what if my friend and I dress up as 21st century princesses? My favorite of the outfits is Snow White’s – it’s adorable and modern. That would involve a lot of buying, though, and I couldn’t pull off that style very well. Aurora is my favorite princess, and I adore that sundress, too. I was thinking I could try to put together an Aurora based around the shirt I wore for Glee or maybe a Cinderella based around my sky blue cardigan. I wish this site was better designed! I can’t link directly to the shoe I want, but: Glenbrook White/Black. Saddle shoe with a heel. I think it’s totally adorable and would be a bit of whimsical fun. Or it’d be too hipster. It’s a fine, fine line. But I’m tempted. Thoughts? G.H. Bass & Co. Official Online Store. Classic and edgy styles of shoes for women. Right across the street from the theater was Anthropologie. I wasn’t going to go, I wasn’t going to try anything on…and then I was in line for the bathroom and there was someone wearing the Mompos dress behind me. It was clearly A Sign, people. And who am I to argue? Found this on the sale rack. It’s basic, but I’ve been wanting another striped shirt. I like the side details, and I like the sleeves. If I see this on my next visit, it’s worth getting. I have lots of styling options in mind. OH MY GOD LOVE. Mad love. I tried on the size 8, and it was roomy around the chest as well as the swingy waist, so I’m going to try sizing down on my next visit. (I only had time for one round of trying on this time.) But it’s a definite winner – little expensive, but again, I already have styling ideas and I’m not sure it’ll make it to clearance. I love dragonflies, and bows, so I had to try these on! They are cute and so comfortable. I grabbed a size 12, as I always worry about how shorts will look on me, but these were far too big. Which, well, duh. I guess I never believe that I am an 8 now. If these make it to the sales rack, I will definitely buy them, but the cuteness factor isn’t worth $88. What’s with the sour puss? 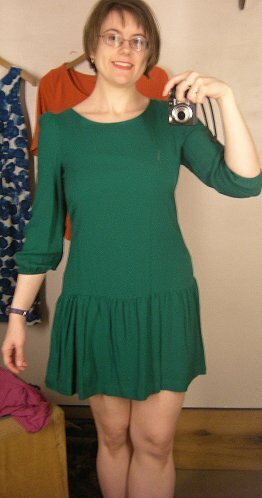 Mostly I forgot to smile and just look grumpy otherwise, but also it’s “Oh, FML, I love the damned $228 dress.” But again – I grabbed a size 12! All reviews said to size up, and I wasn’t sure where I fell in anthro sizing, but clearly, it’s not a 10/12. I was swimming in it, and the belt had several inches of give. When I tugged the belt to where it should be, though, and it skimmed my waist, it gave me my dream silhouette. I have such love for this dress. My next visit, I will try an 8 or 10 and see how it goes. This may just have to come home with me. I could swing a brown cardi over it, or even maybe pink. Or grey. I have the shoes, too. And I want to wear more dresses this summer. So, uh, yeah. I am clearly in a BUY BUY BUY mindset. But look at the pretties!